Is the Public Service Loan Forgiveness plan a good idea? When I’ve asked students “What is one question I can research or answer for you?”, the topic of student loan forgiveness has come up several times. 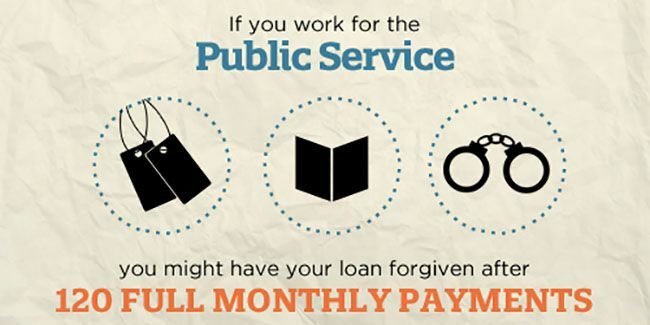 While I’ve addressed student loan forgiveness in the past, I haven’t specifically addressed a variation of this: the Public Service Loan Forgiveness (PSLF) plan. While the traditional loan forgiveness plan takes twenty years and the remaining balance is taxable, under the PSLF plan the balance is forgiven in ten years and isn’t taxable. Given that the primary requirement is working for a 501c3, this seems like an obvious route to go for many going into non-profit work – specifically to those in Seminary going into church work or counseling. So as we look at these three conditions, keep in the forefront of our minds the risk of time – can we maintain these conditions for 10 years? You make WHILE employed. You can’t make a qualified payment if you’re laid off, have a couple months between jobs, retire early, are on unemployment, become disabled, etc. Must be 120 separate payments. You can’t prepay the loan payments, make several payments at the same time, or in any other way ‘jump ahead’ in the plan. All payments must be on-time. You have to make all the payments within 15 days of the due date or they don’t count as a qualified payment. If you aren’t employed as a full time employee, the payments don’t count as a ‘qualified’ payment. This includes any time you might be between jobs, your company goes out of business, you take some time off to have children, or any other reason you might be out of the workplace. This includes most 501c3 and all government organizations. This might not be an issue if you plan on being a public school teacher, or work as a counselor for the county Family Services. These jobs are longer career tracks in more stable environments. But for most non-profit work this is a mess. The turnover rate in non-profit work is high. Non-profits can close or go under if they lose funding. These positions also chronically underpay, so it may be likely that you’re offered a position in a for-profit field at a significant salary increase. Question: I am employed full-time by a qualifying not-for-profit organization that engages in religious activities. Does my employment qualify for PSLF? This basically makes this program unavailable for anyone working in a church or most para-church ministries – including ANY ministry based in another country. “Recently I’ve been hearing more and more about loan forgiveness after 10 years if you work for a non-profit, and it seems that the general impression out there is that this will apply to our students working in churches, which are 501(c)3 non-profit organizations. If you have student loans with interest accruing faster than you’re paying it, rising balances that you legally can’t bankrupt out of, and you’re forced to work for the government for a minimum of 10 years this is starting to sound like indentured servitude. At least those in ancient Israel that sold themselves into slavery were supposed to be freed every seven years. This isn’t a huge deal, but it is a consideration. This may be unlikely, but it’s a lot of eggs to put in the basket of two administrations from now. By nature of the program, extra payments are extremely discouraged. If your eggs are in this basket, any extra principle payments essentially feel like throwing money away. You can’t finish earlier than 120 payments and 10 years. If you follow the program flawlessly for 9 years and some circumstance changes that doesn’t allow you to finish the program there is no ‘meet in the middle’. You just don’t qualify. Because minimum payments are based on income, if you make ‘too much money’ you will be required to make a payment that is more in line with the Standard Repayment. I’m not a big fan of setting up systems that penalize success. If students are considering this as their primary (and truly only) route to loan repayment, they are far more likely to borrow significantly more than the cost of their tuition. For these reasons, the reasons I had previously outlined, and my belief that God values freedom, I don’t recommend pursing this as your loan repayment plan. If you find yourself in a position (say as a school teacher) that you enjoy, don’t plan on leaving, and that qualifies for the PSLF, I don’t see any ethical problem in taking advantage of the program. In that situation, I would recommend aggressively saving money in a separate savings account so that if the situation arose where you were unable to finish the 10 years/120 payments, you could write a check and pay off the balance.